For centuries the house of McDonald sat upon the Iron Skillet and ruled the Seven Fast Food Kingdoms with a mythical burger that drew its power from a mysterious special sauce. 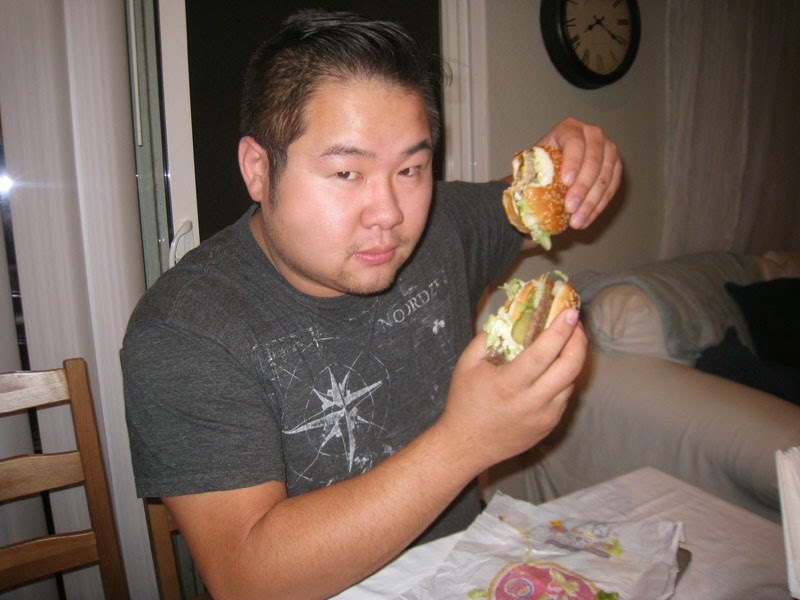 Many have tried to challenge The Big Mac, some even declared a full-scale war (like the Big Carl) but were crushed by The Big Mac's weird third bun. This blog will chronically in detail the epic battle between these two burgers. 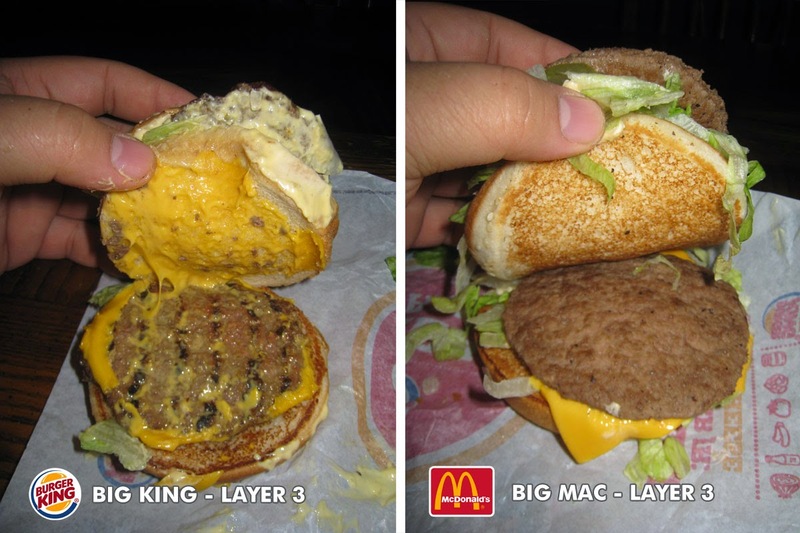 When I first put them side by side you can definitely see that the Big Mac is quite larger than the Big King. (Big Mac: 1 - Big King: 0) Maybe it's because the Big Mac's buns are made from a compound that can withstand a 40 ton nuclear blast and that's why the bread keeps its shape. 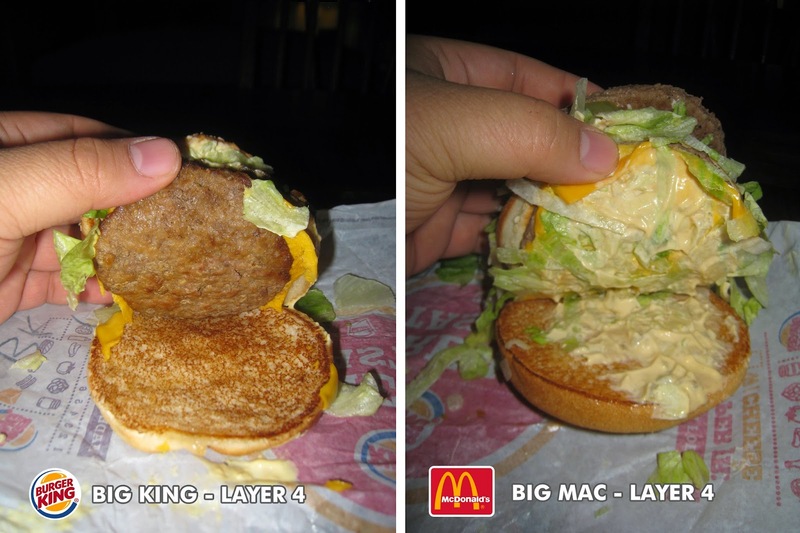 In the final layer we see the first and final appearance of The Big Mac's special sauce. It would have been nice if they had put the cheese on the previous layer to to separate it from the lettuce. So who gets to rule the Iron Skillet? 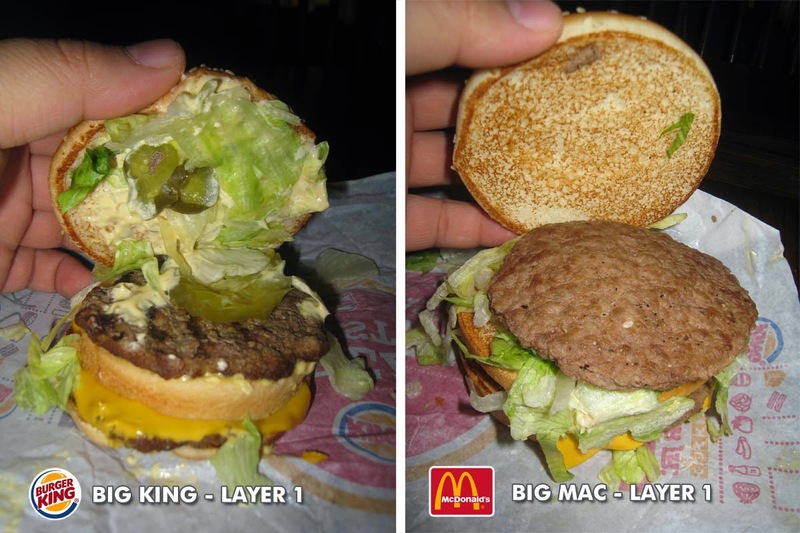 When it comes down to aesthetics, the Big Mac looks like the superior burger but when you break it down into layers, The Big King looks like it was better constructed with higher quality ingredients. But what it all boils down to is the taste. Which one of these burgers reigns supreme? First off, the Big Mac tasted clean and wasn't messy. The amount of sauce complimented the burger fine and it tasted pretty good. 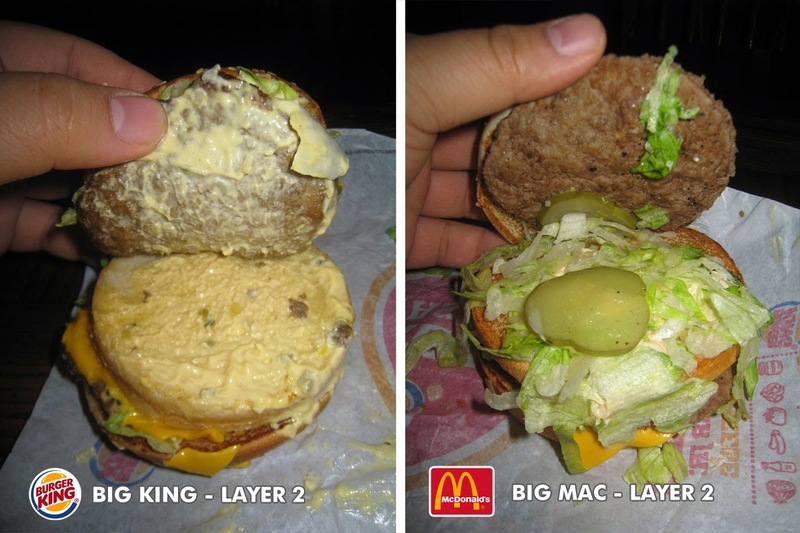 The Big King on the other hand had much better quality ingredients (better meat & better pickles) and seemed to have more special sauce than The Big Mac but for some reason I really didn't like it as much. My wife also tried the vs. challenge with me and also agreed that there was something off about The Big King. Both can be purchased for $4 which I think is waaaaay over priced and both will significantly reduce your life span just as equally. anywho, i'm going to eat both. screw you neurotics. I'm still with Burger King. That thrown together trash is not that mine. 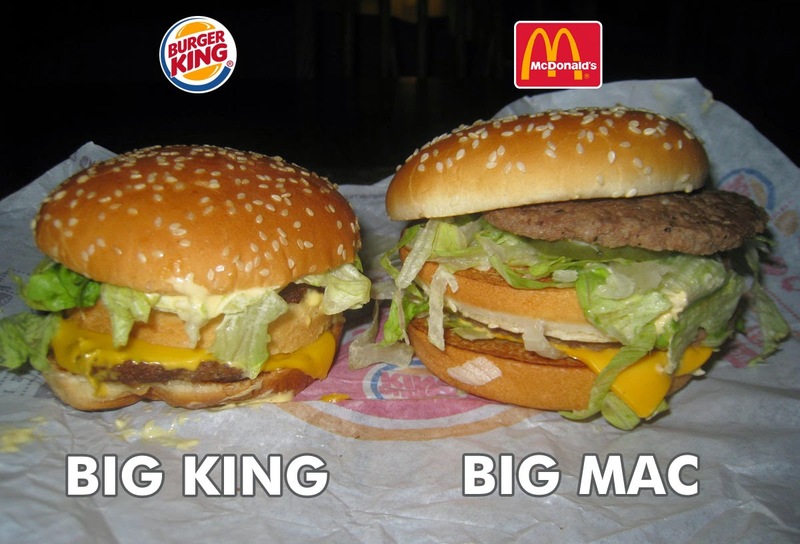 And i wouldn't compare Big King & Big Mac.